Business Intelligence and OLAP systems are no longer limited to the privileged few business analysts: they are being democratized by being shared with the rank and file employee demanding a Relational Database Management System (RDBMS) that is more OLAP-aware. DB2 Cube Views and its cube model provide DB2 the ability to address multidimensional analysis and become an actor in the OLAP world. 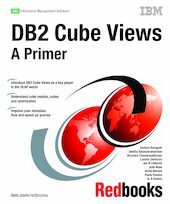 This IBM Redbooks publication focuses on the innovative technical functionalities of IBM DB2 Cube Views V8.1 to store multidimensional metadata in DB2 catalog; to build automatically model-based summary tables to speed up query performance; and to provide an advanced API to allow other Business Intelligence partners’ tools to benefit from both metadata exchange and improved query performance. This book positions the new functionalities and their benefits, so you can understand and evaluate their applicability in your own Business Intelligence and OLAP system environment. It provides information and examples to help you to get started planning and implementing the new functionalities.